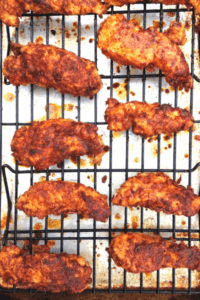 Spicy and delicious Boneless Nashville Hot Chicken Tenders! 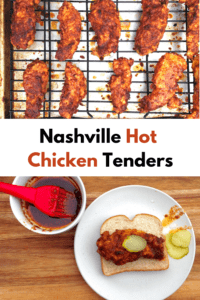 Let me show you how to make fried chicken tenders with an amazing Nashville Hot Chicken Sauce recipe. You HAVE to try them! Nashville Hot Chicken is taking over the world. And if you haven’t tried it yet, you’re definitely missing out. It’s spicy, a little sweet — and addicting. 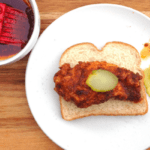 The good news is, even if you can’t find Hot Chicken at a restaurant near you, you can make it at home. That’s why I’m sharing these Chicken Tenders with Nashville Hot Chicken Sauce with you today. My family loves this recipe so much that I’ve made it once a week for the past month. The chicken tenders are awesome on their own, but with the Hot Chicken sauce, they are over-the-top good. I’m kinda obsessed with Hot Chicken. All I know is that if Hot Chicken is wrong, I don’t want to be right. Hot Chicken is a decades-old Nashville tradition, which takes Southern fried chicken and covers it in a spicy-sweet paprika oil. Rumor has it that the original hot chicken was made when a man cheated on his girlfriend, and she wanted revenge. She served super spicy fried chicken to him, thinking he would suffer, but instead, he loved it. In fact, he couldn’t get enough of it. So he opened up a restaurant that sold only hot chicken, and it’s still there today. If you’re wondering what Hot Chicken tastes like, your main point of reference may be Buffalo wings, but Hot Chicken tastes nothing like Buffalo wings. Instead, think fried chicken with a little sweetness and a whole lot of spiciness. But don’t be intimidated by the spiciness: if you’re making Hot Chicken at home, you can control the spice level. Now let’s make some Hot Chicken Tenders! 2. Combine the buttermilk, pickle juice, and salt and whisk the eggs into the mixture until blended well. Add the chicken to this mixture to marinate for at least 30 minutes. 3. Combine the flour, salt, garlic powder, paprika, pepper, and cayenne in a flat dish. 4. Heat 3 cups of oil in a deep pot until it reaches 350 degrees or until a drop of water sputters when dropped in. 5. Remove 3-4 pieces of chicken from the marinade at a time and dredge it in the batter until completely covered. 6. Carefully place small batches of chicken in the oil and fry for 3-4 minutes on each side, until golden brown. 7. Drain and cool on a wire rack. 8. In the meantime, heat the butter and the rest of the sauce ingredients in a small saucepan until the butter is melted. 9. Brush the chicken with the hot sauce. Keep a cold drink close by and enjoy! If you’ve never made fried chicken before, there are a few tips and tricks you need to know. Make an assembly line with your dishes in this order: marinating, breading/batter, and frying. As you lift a chicken tender out of the marinade, you can set it right into the breading, and then set it gently in the oil to fry. Only fry 3-4 pieces of chicken at a time. If you do more, it lowers the heat of the oil. For people who don’t like spice, these chicken tenders are good alone. 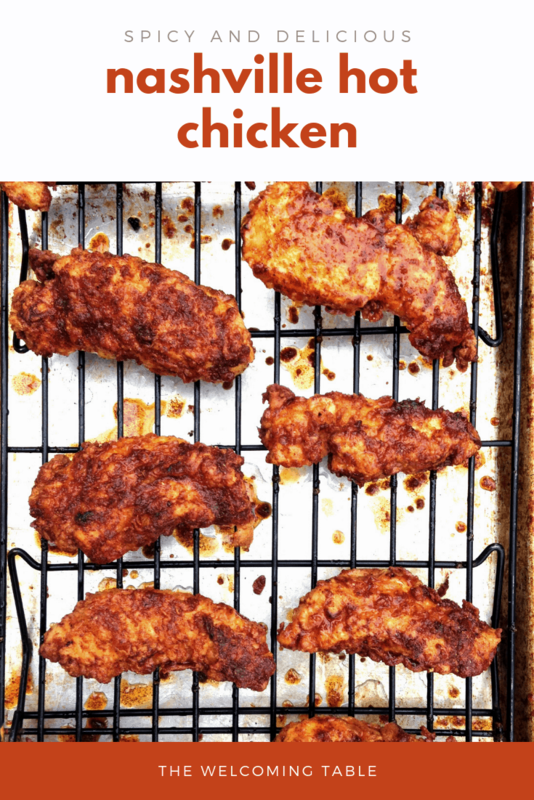 Serve one platter with plain chicken tenders and another with the Nashville Hot Chicken sauce. You can control the level of spice with the amount of cayenne you put in. You’ve got to serve dipping sauces with Hot Chicken. My favorite is homemade Ranch, but honey mustard and honey are also good choices. 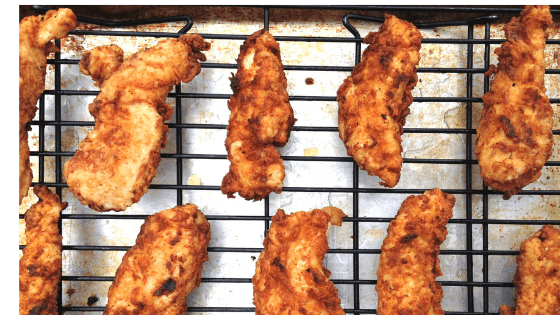 Whether you’re a wimp when it comes to spice or you like to eat until smoke it coming out your ears, you’re going to love these Nashville Hot Chicken Tenders. Are you ready to make some? Let me know in the comments! Cut each chicken breast into 3-4 strips. Whisk the eggs into the rest of the marinade ingredients and put the chicken in the marinade for at least 30 minutes. Combine batter ingredients in a flat dish. Heat the oil in a deep pot to 350 degrees or until a tiny drop of water sputters. Carefully take 2-3 pieces of chicken out of the marinade and coat completely in the batter ingredients. Place carefully in the oil and fry 2-3 minutes on each side until golden brown. Drain and cool on a wire rack with paper towels underneath. Heat the butter in a small saucepan along with the other sauce ingredients, until melted. 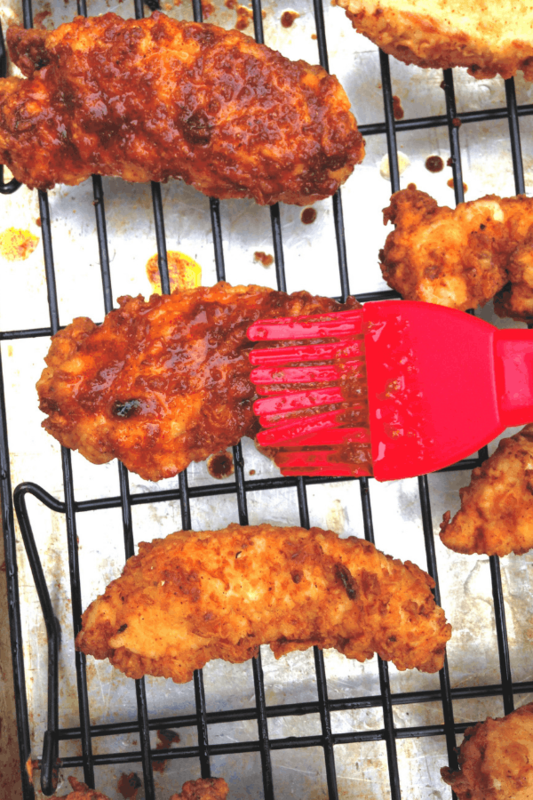 Brush the chicken tenders with the hot sauce and enjoy!